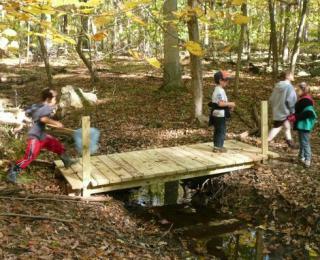 History: The Charles Evans Children's Discovery Trail was dedicated on October 22nd, 2011 and is made possible through a generous donation from the Charles Evans Foundation. Directions: From Route 206, turn onto Elm Road (the Great Road). Take a left onto Drake’s Corner Road- look for the Princeton Academy of the Sacred Heart sign. Take Drake’ Corner Road to the end and the trailhead will be on your left. Street parking is available.